Once, when Markandeya was in his Ashrama on the banks of the river Pushpabhadra he saw that a strong gale was blowing and this was followed by a fierce storm Before many moments had passed he saw that the earth was covered with water He realized that The Great Deluge had come. Markandeya was floating on the turbulent sea which carried him away from his Ashrama. He knew not that this was Vishnumaya which he had been wanting to see. All on a Sudden he saw a Nyagrodha trees which was standing firm in the midst of the waves a branch of the tree could be seen pointing toward the direction Ishanya There on a leaf he saw a lovely child which was dispelling the darkness around with its glow. Green like a newly broken piece of an emerald mountain with the red flowers of the pomegranate adorning its ears the child had raised his foot to his lips. It was sucking its toe with a beatific smile on its face. Markandeya was swept near and was and sucked into the body of the child along with its breath inside. When he opened his eyes. Markandeya saw the Universe The small child small enough to lie on an Ashwantha leaf held inside it the entire Universe Yashoda was also granted this vision when Krishna opened his month. This was the vision of Markandeya. In 1937, she married Dr. V.S Subramaniam the renowned E.N.T surgeon of Madras. In spite of being pre-occupied with the affairs of her family she wrote a series of Imaginary conversation on the model of Landor’s for the Triveni under the pen name of Ketaki. Her love of literature nursed over the Year’s expressed itself in her developing a fascination for the Epics and Puranas of India. Smt Kamala Subramanian’s condensation of the Mahabharata a Bhawan’s publication has won wide acclaim. 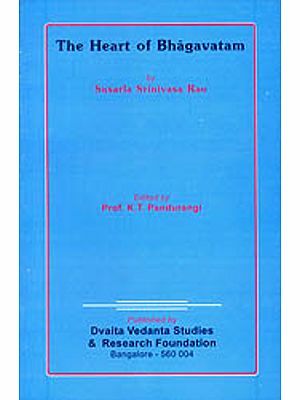 She now makes available to the English Knowing public a faithful condensation of the Bhagavata of the original. This is the second in the author’s tried the third one being the condensations of Valmiki’s Ramayana also published by the Bhavan. If the setting of Bhagavad Gita is a battle field where opposing are arrayed against each other the setting of the Bhagavata Purana is no less arresting and awe inspiring. A great and virtuous king Parikshit by a quirk of fate is doomed to die of snakebite in seven days As the Bhagavatam opens we see him listening with faith and devotion to the recitation of the Purana seeking the ultimate that any human being can aspire for namely freedom or liberation after attuning which one know no fear and is all peace. Indeed the serpent King Takshaka dramatically arrives at the appointed hour and deals death to the king’s body which is reduced to ashes by the venom But by that time death had lost all its sting for the king. Did not Parikshit tell Suka at the conclusion of the Bhagavata Purana recital Lord I Leaf neither Takshaka nor death now that I have neither Takshaka nor death now that I have entered the fearless and blissful and blissful state of Brahman. This then is the glory of Bhagavatam acclaimed as the essence of all Vedic wisdom namely its power to make one remain poised even at the point of death. And if India’s spiritual tradition is kept alive today it is largely because of the Bhogavatam and its systematic exposition throughout the country with the result that its teaching have permeated the subconscious of the masses. The Bhagavatam has been aptly described as the spiritual butter churned out of the ocean of the Veda milk for the benefit of those who are pure in heart free from malice and envy and are keen to hear it. All mankind is Bhagavatam But the massage will come loud and clear only when one really yearns for it when Shraddha enters the soul as it did in the case of Nachiketas. Bhagavatam being the culmination of Jnana and Bhakti is dear alike to the Advaitin Vishishtadvatin and the Dvaitin Its appeal is to the head as well as to the heart The very fact that it is a Purana proclaims aloud the truth that it is not an esoteric text meant for a Select few but a sacred scripture meant to bring within the peace that passeth understanding. Dry philosophy seldom seldom appeals to the human mind But in the Bhagavatam even the most abstruse philosophic truths are put across by means of stories and legends This is the secret of its popularity among all classes of people. This is a summarized version of the Mahapurana Srimad Bhagavatam written by Smt. Kamala Subramanian. Earlier Smt. 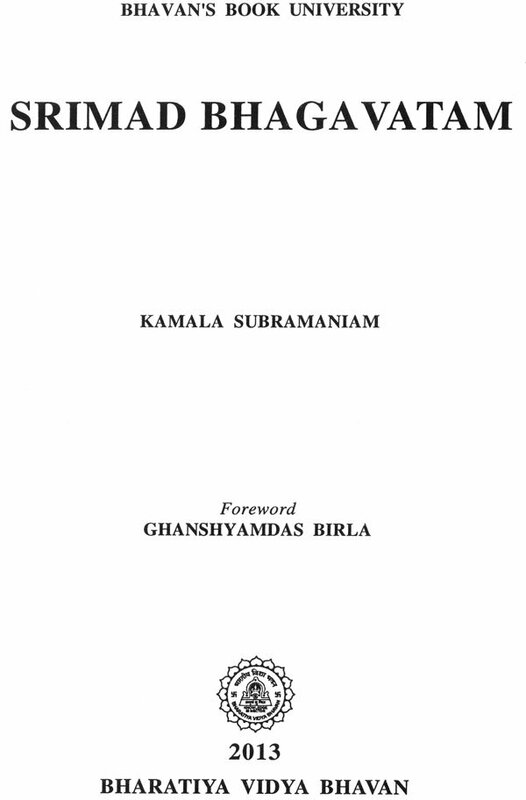 Subramaniamhad brought out a condensed version of the great epic Mahabharata also which become very popular and was highly valued by the society at large. While summarising the Mahapurana, Smt. Subramaniam has omitted only the ornamentations and decorations, in all Sanskrit literature she has uncompromisingly kept intact the solid core of the Mahapurana. Not only she has taken no liberty with the essentials of this sacred Book but in fact has brought them out more prominently in a language which is as simple as it appealing. The readers of this sacred book will thus derive great spiritual benefit not confined to the Hindu society alone but also to mankind outside the Hindu fold. While studying the Kathas- the stories of the of the great personalities and of the avatars and the parables the reader as he reads the passages should amply digest them to know the true purport of the suggestions the lessons and the indication behind them. These are not just embellishments they have a deep meaning under the surface Attentive study of these shall spiritually inspire the reader more than the Kathas themselves. It is not my desire not it is desire not it is desirable to make any comments on the content and object of this Mahapurana. Such an effort on my part shall deprive the reader from drinking the joyful nectar which the original text contains in an adequate measure. Let the reader read the summarized version and if attracted also the unabridged Grantham digest and reflect and draw inspiration also there from to mould his life and achieve the spiritual bliss and tranquility which is the ultimate goal of all the pilgrims of life the- Jeevan Yatra. 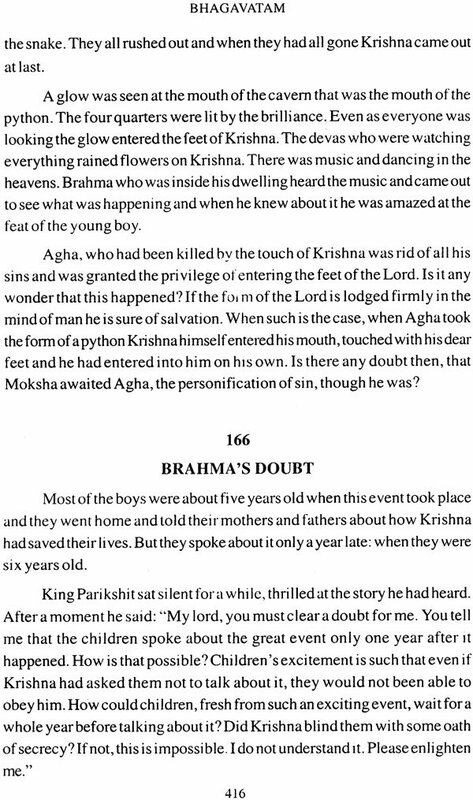 The story goes that even after composing the after composing the Mahabharata Vyasa was not completely happy. 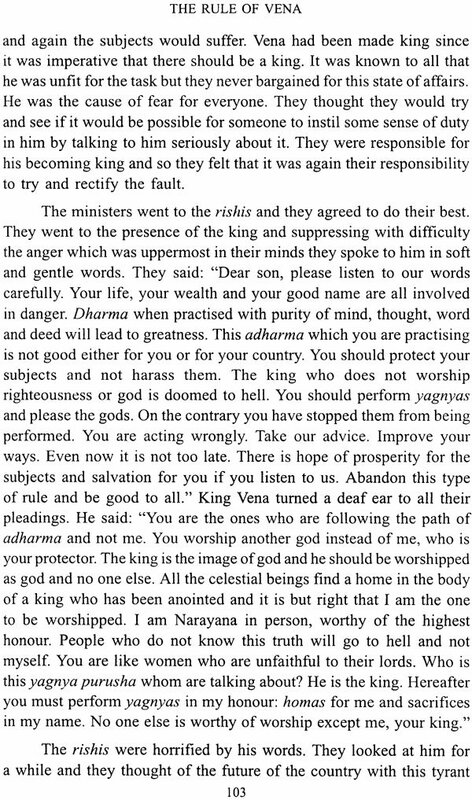 On relating his dissatisfaction to the sage Narada, Vyasa was told that his restlessness was due to the fact that while in Mahabharata he fully propagated Karma Yoga, he neglected Bhakti Yoga and that he should write something more in the glory of Narayana which alone shall give him the full mental tranquility. 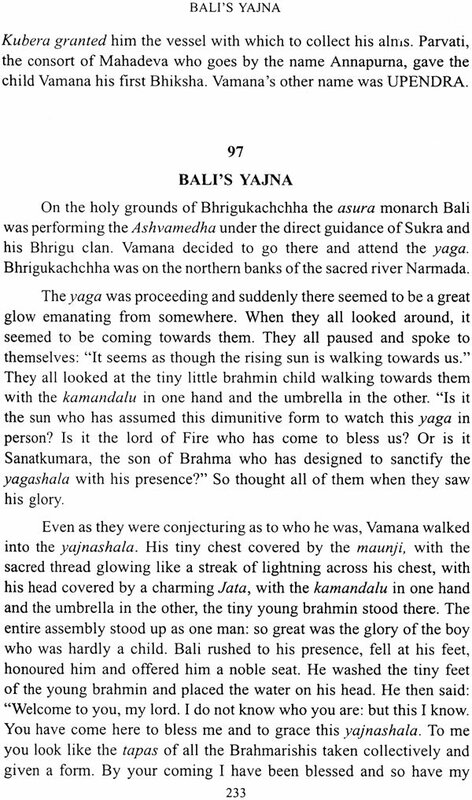 It was at this suggestion of the sage Narada that Vyasa compiled Srimad Bhagavatam. The general impression that Bhagavatam is purely a Purana of Bhakti yoga therefore is not unnatural But on proper appreciation of the Mahapurana we shall discover that while Bhakti does dominate Jnana and Karma have not been neglected in Bhagavatam . To put it correctly the Mahapurana is the Sangam Confluence the Triveni of the three streams of Bhakkti Yoga Karma and nana Yoga. Some year back, I made an attempt to narrate the story of the Mahabharata. I must say that I succeeded to an extent in my attempt and the book was published under the aegis of Kulapati Shri K.M. Munshi. My thoughts were then turned toward Sri Bhagavatam. To many people the Bhagavatam signifies only Krishnavatara. In several Pravachanas I have heard only the tenth canto has been dealt with in great detail and the talk ends invariably with the wedding of Krishna with Rukmani and that is the end of it. There are quite a few however, who are familiar with the ten avatars of the Lord: Matsya being the First and Kalki, the last. But then, there are many more avatars- descents-of Lord Narayana down to the earth during the three Yugas. I was eager to tackle this great Purana and try to make Young minds familiar with it. Right from the beginning one fact was clear. Sri Bhagavatam is entirely different from Mahabharata. There is a continuity in the Mahabharata, in the story, which makes the narration comparatively easy. On the other hand, the Bhagavatam is made up of a number of isolated stories, incidents and innumerable episodes. There is no continuity here to hold the attention of the reader. I was at a loss as to how I should begin. There are several places where one can say: &amp;amp;amp;amp;amp;quot;This is the beginning.&amp;amp;amp;amp;amp;quot; The Bhagavatam is repeated from mouth to mouth and it is related to different people by different preceptors. It is a confusing, tantalizing, labyrinth where one easily gets lost. And again since, Bhakti is the central them, there are numerous passages where the praises of the Lord are sung. 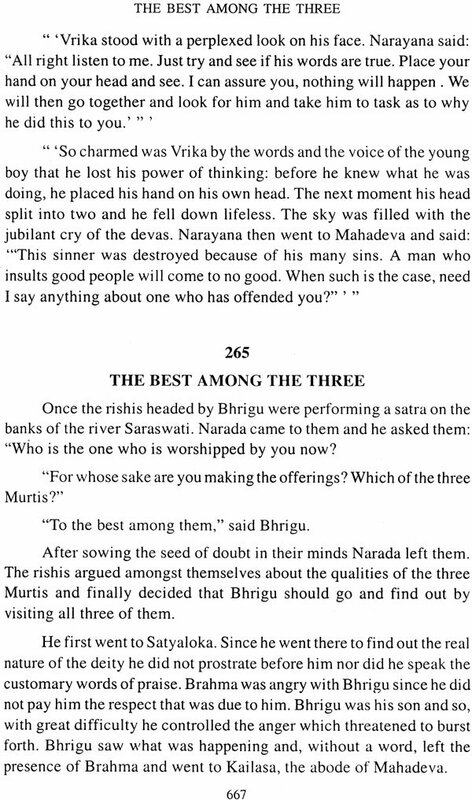 This is mostly by Brahma who with Devas recites the Purushasukta. I was afraid that constant repetition would be unwelcome and so I have condensed some of the prayers and omitted some others altogether This was unavoidable. The Bhagavata Purana is made up of ten sections. The first called Sarga. It comprises the creation of the universe, of the universe the Mahat and aham tettvas, and the tanmatras. The manifestation of the Virat Purusha; the Virat Purusha the creation of living and living beings by Brahma, Hiranyagarbha, is called visarga the establishment of each created being in its proper place by the Lord is called Utkarsha. His Grace who is infinite towards his Bhaktas and which goes by the name poshana. The narration of the different periods of time started by different Manus is Manvantara. The Vasanas following the karmas performed in the previous Janma are called oothi. The stories about the Lord and his Avataras are collectively named ishakatha . The merging of the jivatma with the Paramatma after the yoganidra is called Nirodha and the casting a way of objects of enjoyment and even the desire for them which is naturally followed by Atman becoming one with the Brahma is called Mukti. Aabhasa which is creation and Nirodha which is the merging back at the end of time are all caused by the ONE which is Eternal: which has no beginning and no end and which cannot be described by words that is called Aashraya. He is the refuge of everything in the Universe. The aim of every aspirnt is to reach this Aashraya and become one with Him This is the purpose of all tapas, of all Yogas and THAT is the one truth to be realized. I have enumerated the many sections of the Bhagavara Purana in such detail to make the reader understand how complex it is and I hope. I will be forgiven when I say that I found it almost impossible to handle all of it. 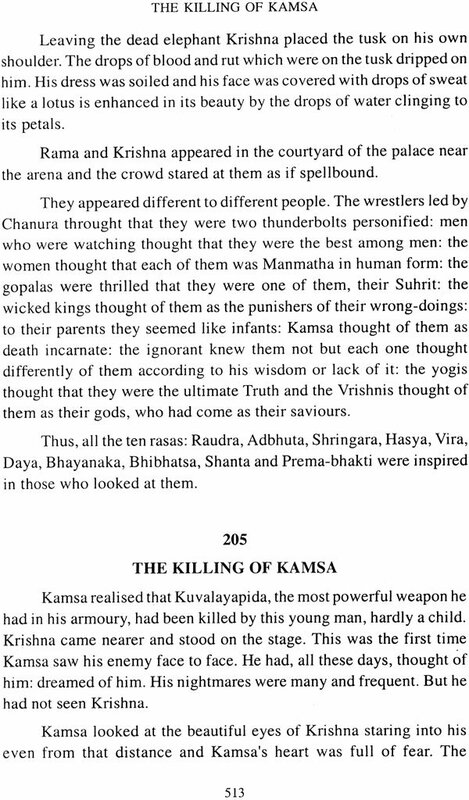 I decided to take up one of these sections Ishkatha, touching on the others here and there. The story of Creation has been related in different places and in different forms. The foremost of them is when Brahma relates it to Narada. Lord Narayana Himself had explained it to Brahma and that is the first version of visarga. Another is when Maitreya learns it from Parasara. Originally Adishesha or Ananta is said to have taught this to Sanatkumara Sankhayana learnt it from Sanatkumara and taught this to Brihaspati Brihaspati passed it on to Parasara from whom Maitreya learnt it and in his turn taught this to Vidura. Considering the complexity of the Purana and Again considering the fact that the reader is expected to be already familiar with the many words and terminologier used in the visarga it seemed to me that it may not be easy to follow it at first reading I have therefore related the same in Chapters 279 to 293. It is all quite complicated and I cannot claim that I have been able to do full justice to the grandeur and sublimity of the subject. I have tried to begin at the very beginning and find my way through the confusing, distracting and, at the same time, fascinating wilderness called Bhagavatam. Barring the Purushasuta which occurs again and again throughout the Purana like the refrain of a song or like the hypnotic drone of the tempura in a musical concert, I must draw the reader’s attention to some beautiful stotras. The first of them is the adoration of Krishna by Kunti where she says may misfortunate visit us continuously. There is the worship of Narayana by the child Dhruva and later, the words spoken by the other child Prahlada in praise of the lord in the form of Narasimha. 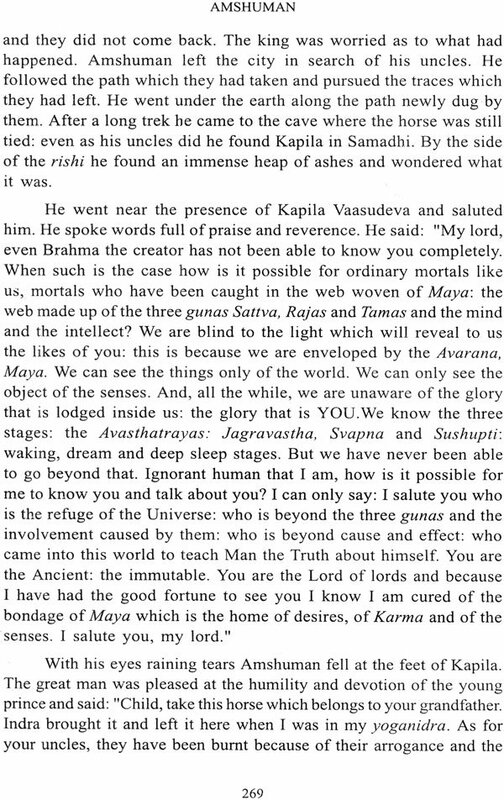 One of the most beautiful passages in the Purana is the long conversation between Krishna and Uddhave at almost the end of the book. Part of it I had to place in the end since it seemed likely to tire the reader at the first reading. This conversation is almost a re-casting of the Bhagavad Gita However, I have taken special care not be condense the Avadhula Gita which is sublime. As for the tenth canto which deals entirely with Krishna’s childhood I have not omitted anything. It is not possible to be anything but emotional when one goes through this particular canto. As for the esoteric significance of several controversial incidents in the tenth canto I have not ventured into that field. My work has been just the narration of the incidents. 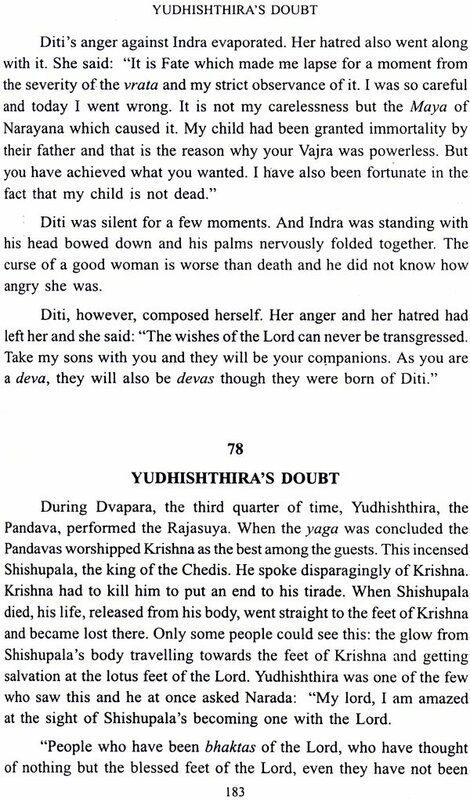 Kapila Vasudeva’s teachings to his mother Devahuati are in the main book. But the Sankhya on which Kapila has elaborated has been placed in the end since it is quite tough. I have tried to elucidate it but I do not know how far I have been successful in the attempt. The glossary has been complied with great care It has become quite voluminous but it is essential that the meanings of the words should be given or else, for those not quite familiar with the phraseology of the Purana it will not be every easy to follow the narrative. In spite of thee many shortcomings the book may, I hope, be accepted by the discerning readers who will be tolerant enough to overlook the lapses. It goes without that is not a literal translation but an attempt to relate the story of the Lord of Narayana and the many forms he donned to establish Dharma on the earth. Twenty six is the number of which Kalki is yet to happen Krishnavatara is the Poornavatara and to lead the thoughts of the reader to words these many appearances of the Lord has been my seire and if the Youngsters who read this book become interested enough in the Purana to try and read it in the original, my purpose will be served. I owe a deep debt of gratitude to Shri Ghanshyamdas Birla for the interest he has taken in the book for the foreword he has been kind enough to write for it.